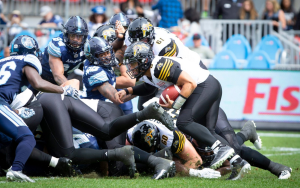 With zero wiggle room left in their playoff push, and needing help from the Redblacks, the Argos push off to Cowtown to take on the class of the league, the Stampeders. Two teams trending in opposite directions face off on a Thanksgiving afternoon at BMO. Argos looking to right the ship against a Stampeders team looking to secure first place. The dome-less Argos are off to Tim Horton’s Field to host the Stampeders in Hamilton. Will the road warriors in Double Blue stop the defending Grey Cup champs? Week 3 sees the Argos take on the Stampeders. Will they continue their winning streak in tact? Jube’s got some ideas.